I’d heard a lot about this place from my ‘cool’ friends but had never ventured there myself until last weekend. It’s has rustic feel with its chunky wooden tables and chairs and it is super cosy when you’ve been out in the cold! From what I’d heard Lee Rosy’s could offer you over 100 different types of tea, delicious home-made sandwiches and even better cake – all of which would be available even if you were vegetarian/vegan/wanted soya milk instead! And all the above was true – ok perhaps there aren’t 100 types of tea…I didn’t count! But the tea selection is outstanding. You can buy it by the mug, pot, to take-away OR in a packet to brew at home to your heart’s content! Now I’ve only got into tea recently – yep English and I don’t like your traditional cuppa, just herbal for me please – but with a list of tea that long you’re bound to find something you like! But it’s more than just a nice cuppa, it’s the atmosphere. A seriously cool laid back “hang-out” with good music in the background, friendly staff and plenty of interesting people to chat with. It’s the epitome of ‘boho’ but is effortlessly so! Just being there makes you feel ‘cool’! They offer monthly games nights, a film night, a knitting evening and gigs! So if you don’t fancy just coming in for a natter with your mates, there’s bound to be something else going on where you can meet new people over a brew! But this is after all a food blog, and as brilliant as the atmosphere of Lee Rosy’s is I imagine you want to know a little more about the food and drink? 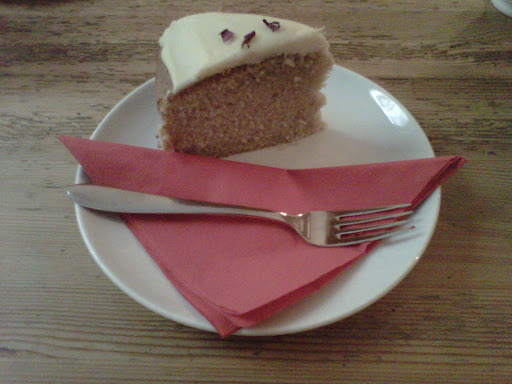 For somewhere that specialises in tea I didn’t expect their cake selection to be as good as it was! As I mentioned above many of these are vegan which is pretty cool. 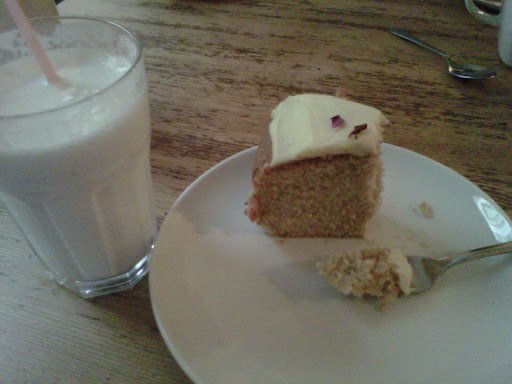 I however went for a cardamom cake with rose and white chocolate icing. Oh, my, gosh! Now I love all things rose flavoured as it is, whether its rose panna cotta or rose flavoured frosting, but the rose combined with white chocolate and the beautiful perfumed cardamom sponge was quite simply heaven in a slice of cake. 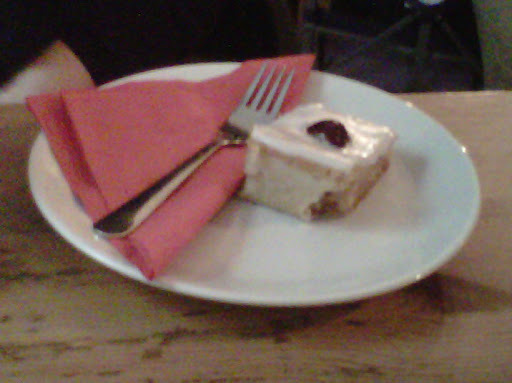 And what made it even better was that it was a HUGE slice of heaven! The perfume of the cardamom was so beautifully fragrant and matched perfectly with the rose. The sweetness of the white chocolate just lifted it to the next level. I seriously need the recipe for this cake! When you visit Lee Rosy’s (which I know you will…) make sure you treat yourself to a slice of this cake! Now I’ve found this hidden gem I don’t think you’ll be able to keep me away! I’m boycotting all homogenised boring “coffee shops” – I don’t even like coffee! No more desperate revision sessions in a noisy Starbucks. I’ll be bringing my work here just to soak up the atmosphere and fill myself to the brim with tea and cake! What more could a girl want. Lee Rosy’s gets 5*****’s from me!